Clara J. Butler was my great-grandfather’s sister. I know very little about her other than her birth and death dates. She never married. She died in 1918 at the age of 28; I wonder if she died in the influenza pandemic? She is buried at Ramsey Cemetery in Ramhurst, Georgia. She was the first person buried in the Butler plot and is the only one with an obelisk-style gravestone. The crown at the top of the marker symbolizes ascent into heaven, glory of life after death, etc. 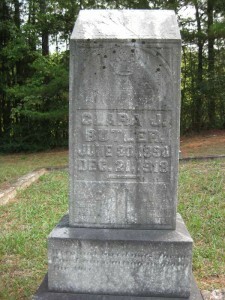 Ramsey Cemetery (Ramhurst, Murray County, Georgia), Clara J. Butler headstone, personally photographed, 20 Sep 2008.